* 1st shoe webzine - Getting the Most out of the Kids Market/Kids or What? Introduction Advisory Service Getting the Most out of the Kids Market/Kids or What? Getting the Most out of the Kids Market/Kids or What? Children have money, children have incredible power when it comes to shopping and shoe retailers still don’t appreciate them sufficiently.” Kids’ and youth market researcher Ingo Barlovic brought along a wealth of helpful tips for his approx. 150 listeners at the third Kids Business Brunch at GDS – International Event for Shoes & Accessories - suggesting how footwear retailers can turn children into customers. According to his data the 6 to 19-year olds in Germany have EUR 23.1 b at their disposal of which they actually spend EUR 22.8 b, EUR 4.42 on fashion. Yet shoe retailers, he said, were still not doing enough to turn this important target group into more loyal shoppers – despite the fact that 70% of the six-year olds already had an active say in shopping for shoes. Nevertheless, children are not a homogeneous target group and can therefore not be categorised according to shoe size. Every one to two years their perception and demands and, hence, the children’s consumer behaviour changes. Children aged 5 to 7 can even be broken down into three different target groups. Moreover, girls and boys sometimes live in completely different “life-worlds”. While boys aged 8 to 12 assess themselves as strong, loud and brash, girls rate themselves as fashion-conscious, bitchy and romantic. “These worlds are what the young shoppers want to find reflected in shoe stores,” Ingo Barlovic explained. “Preferences for fashion brands are formed between the ages of 12 and 17. 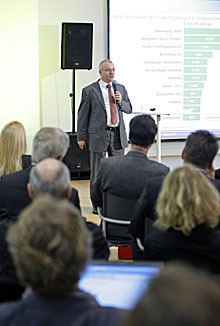 And what we learn in our younger days accompanies us for the rest of our lives,” Barlovic said and added: “Today’s young shoppers are therefore tomorrow’s customers; and your store needs their loyalty.” The market researcher advised the retailers present to adapt to the needs of these young target groups. The task was to work out highly individual retail concepts tailored to the respective demands. Barlovic also recommended to meet these special requirements in advertising: clear product information, age-related approach in goods display, variety, consideration of basic age and gender-specific needs as well as emotionalising presentation by means of experience realms were but afew of the elements to be taken into account for successful marketing. The next GDS takes place in Düsseldorf from 11th till 13th of September 2009.